Think of a mix between Jerry Lee Lewis, Elvis Presley and Elton John and you’ve got Josh Christina. He will restore your confidence in the ability of young musicians to carry on the great tradition of rock’s pioneers. Baltimore based Josh Christina writes his own music, refurbishes the classics, and plays a mean piano. His high energy show appeals to all generations. Josh Christina is a rock n roll revivalist whose music provides a bridge across generational lines by going backward to move into the future. Only playing piano since he was 16, this 24 year old is making quite a name for himself. 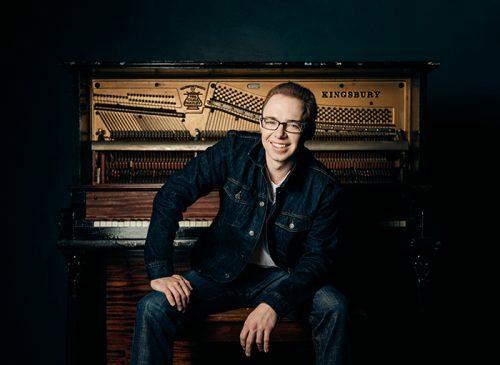 He has recorded 2 albums with Dolly Parton’s producer Kent Wells in Nashville and his latest album “Instincts” was recorded at the historic Sam Phillips Recording studio in Memphis and co produced by two time Grammy award winner Jon Carroll. Josh’s infectious sound hit the international airwaves when he performed live on Ireland’s Late Late Show in September of 2016. Not only did it place Josh Christina upon the world stage, but also introduced this amazing style and sound to a new generation of music fans, followers and believers. His band is made up of players that are the best in business.